Tata Motors said it will launch its ultra-cheap Nano car in Mumbai on Monday - a vehicle meant to herald a revolution by making it possible for the world's poor to purchase their first car. But few predict the snub-nosed Nano will be able to turn around the company, which has been beset by flagging sales and high debt, anytime soon. The Nano, which is priced starting at about 100,000 rupees ($2,050), is a stripped-down car for stripped-down times: It is 10.2 feet long, has one windshield wiper, a 623cc rear engine, and a diminutive trunk, according to the company's Web site. It does not have air bags or antilock brakes - neither of which is required in India - and if you want air conditioning, a radio, or power steering, you'll have to pay extra. 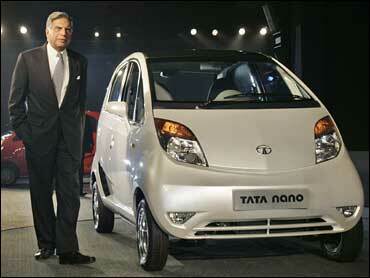 Tata Motors has been hard-hit by the global downturn. Commercial vehicle sales, its core business, have been decimated as India's growth slows, and consumers have had trouble getting affordable car loans. The company declared a loss of 2.63 billion rupees ($54 million) for the October to December quarter, and it has been struggling to refinance the remaining $2 billion of a $3 billion loan it took to buy the Jaguar and Land Rover brands from Ford Motor Co. in June. Even the launch of the Nano has been scaled back. The car is arriving six months late because of violent protests by farmers and opposition political party leaders over land, which forced Tata to move its Nano factory from West Bengal to the business-friendly state of Gujarat. Company officials have said it will take at least a year to complete the new factory, and until then, Tata will only be able to produce a limited number of Nanos from its other car plants in India. Tata Motors hasn't yet given details on production volumes, but most analysts doubt the company will be able to make more than about 50,000 cars in the next year - a far cry from the 250,000 the company had planned to roll out initially. Vaishali Jajoo, auto analyst at Mumbai's Angel Broking, said even if Tata Motors manages to sell 250,000 Nanos a year, it will only add 3 percent to the company's total revenues. "That doesn't make a significant difference to the top line. And for the bottom line, it will take five to six years to break even," Jajoo said. Still, in this new age of global thrift, the Nano sounds appealing to more than just the struggling farmers and petty businessmen across India that Tata initially had in mind for the car. "What do you think the chances are that the Nano will come to America? Personally, I'd love one," Steven Smith, whose first car was a Volkswagen Dune Buggy, wrote recently on the Nano Facebook page. Tata Motors unveiled the Tata Nano Europa, a slightly more robust version of the Indian model, at the Geneva Motor Show this month, with a planned launch of 2011. But the company has no plans to bring the Nano to America anytime soon.